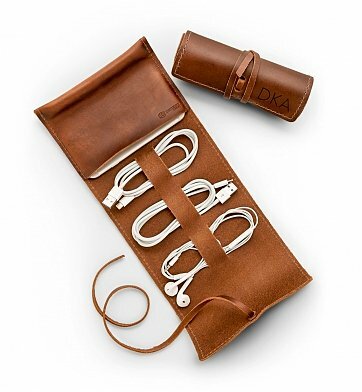 Genuine saddle leather is polished to perfection on this innovative cord keeper, perfect for organizing chargers and cords during travels. With a functional roll-up style and complimentary embossing on the surface, it's a stylish and useful gift for friends and family, colleagues or clients. One Polished Leather Cord Wrap. Your gift is securely wrapped to safeguard the shipping process and arrives in a signature GiftTree gift box. A free card with your personal message is included with your gift. Personalized Leather Cord Traveler is a hand delivered gift. These gifts are delivered by one of our local design centers located throughout the United States and Canada. Same day delivery is available for most gifts when ordered before the cutoff time. The cutoff time for Personalized Leather Cord Traveler is 2 PM in the recipient's time zone. Genuine leather cord wrap, handmade in the USA.